Yoga classes that are specifically designed for pregnancy and create a place where women can relax, meet other local women and share their experiences. Time to rest, relax and restore. Time to connect, laugh and share. Time to honour the emotional and physical journey of your pregnancy. Time to prepare for your birth. Highly recommended by midwives, yoga keeps the body healthy and supple without straining, boosts energy, relieves stress and anxiety, and promotes restful sleep. This yoga practice is very sensitive, nurturing and suitable for all stages of pregnancy. Gentle yoga poses help to alleviate common pregnancy problems, develop awareness of changes in the pelvis, support good posture and foetal positioning. Each session starts with a calming meditation and ends with a deep relaxation. Helen was inspired by Frederick Leboyer’s ‘Birth without violence’ which she read as a child. It is a powerful book that has influenced her life. During her first pregnancy in 1997 she discovered Janet Balaskas and attended ‘active birth’ classes. Since then she has been interested in the ‘active birth’ movement. In 2005 she trained as a Doula with Michel Odent, the French obstetrician who pioneered water births. Helen is passionate about the need for women to reclaim their birth experiences and loves working with women during this magical time. ‘I’m constantly inspired by the wonderful women I meet and whole heartedly embrace supporting them during their physical and emotional journey.’ Her own three birth experiences have also been a huge source of inspiration. They were all very different; two of her babies were born at home and two were born in water. ‘Each time, yoga helped me to trust my body, stay with my breath and to relax.’ Francoise Barbira Freedman (founder of Birthlight and Medical Anthropologist at Cambridge University) confirmed her instinct to nurture women in pregnancy and to encourage a gentle, holistic yoga practice. 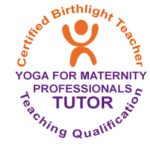 Helen now works as a yoga for maternity professionals tutor for Birthlight in Australia.